GREAT NECK, New York, May 10, 2017…United Capital Corp. announced today that it has acquired the DoubleTree by Hilton South Bend. This 291-room property is ideally situated along the St. Joseph River in downtown South Bend, Indiana, and part of a two-building complex that also houses the 1st Source Bank corporate headquarters. The DoubleTree is the only branded, full-service hotel in South Bend, and offers an array of amenities unlike any other in the area. The Property features 22,500 sq. ft. of flexible meeting space, which is ideally equipped to accommodate meetings and events for up to 700 guests, as well as a Starbucks cafe, indoor swimming pool, 24-hour business center, fitness center and a concierge lounge. Also, located in its beautiful nine-story atrium, the hotel features Baker’s Bar and Grille, a full-service restaurant featuring a classic American menu and Studebaker themed décor. Baker’s Bar and Grille is an excellent amenity for overnight guests as well as a local favorite. 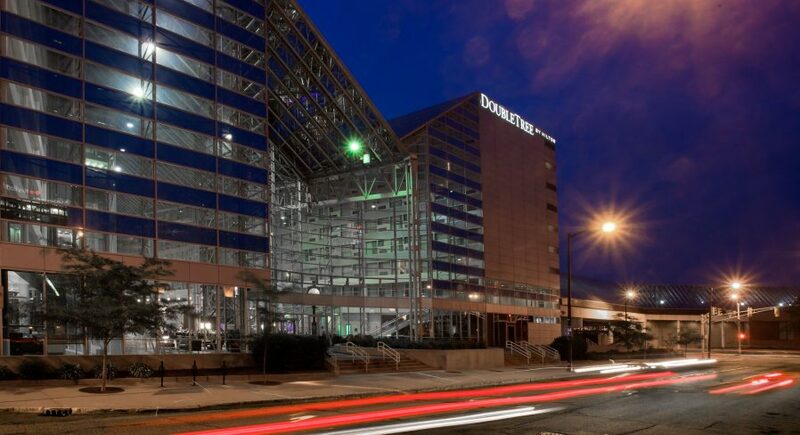 The DoubleTree is connected, via climate controlled walkway, to the Century Center Convention Center which includes more than 225,000 sq. ft. of flexible, indoor and outdoor meeting space, the only such hotel to offer this amenity. “We are excited to have completed the second hotel acquisition of the year and be adding such a well-appointed property to our portfolio. This hotel is the premiere property in the area and ideally located near the University of Notre Dame and the only hotel with a skyway connected to the Century Center,” noted A.F. Petrocelli, United Capital’s Chairman and President.